First folio printing slipcased hardback published by The Folio Society in 1998. First published in 1922 by Shakespeare and Company in Paris. Near fine. 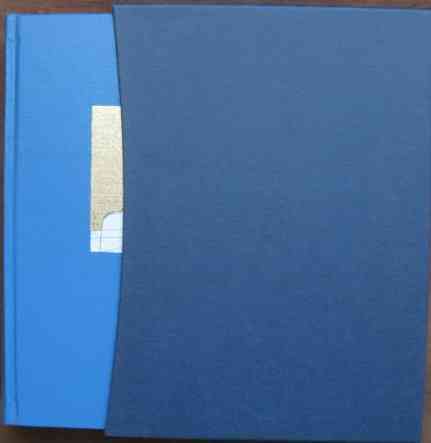 First folio printing slipcased hardback of ULYSSES by James Joyce and published by The Folio Society in 1998. First published in 1922 by Shakespeare and Company in Paris. Previous owner name and date to front endpaper. The book is in near fine condition (blue cloth boards with gold lettering to spine and Joyce caricature to front) with no significant wear. The book is in a near fine slipcase that also has no wear to speak of. A facsimile reproduction of the 1926 second edition, with broken characters corrected and blemishes deleted. Preface by Stephen James Joyce. Introduction by Jacques Aubert. With Mimmo Paladino's etchings which were first published in a 1994 limited edition of 18 copies. 735 pages plus Preface, Introduction and Note on the Etchings.